February 11th, 1910 Ursula Todd is born in the midst of a snowstorm. Unfortunately, she dies with the umbilical cord wrapped around her throat. However, on the same night Ursula Todd is born healthy and whaling. This becomes a pattern for her life, as Ursula grows up she dies in different unfortunate ways and she always comes back to her birth, perpetually living her life in a loop, but each time is somehow slightly different. Ursula gets feelings of anxiety, sometimes knows what will happen just before it does, and has frequent déjà vu. With each choice Ursula makes in her life, the ripple effect is surprising and every life she leads is an intricate puzzle filled with events and people that fit together differently, but somehow always fit together. "What if we had a chance to do it again and again... until we finally did get it right? Wouldn't that be wonderful?" Most of the time Ursula doesn't think so, but when she embraces the notion of "practice makes perfect" and takes the advice of a philosopher, who often thought about life in loop, to "become such as you are, having learned what that is," Ursula has the capacity to change everything. 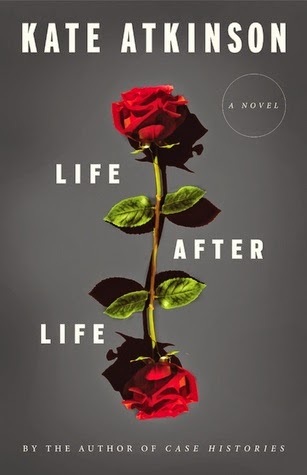 Life After Life is a difficult book to rate and review because in some ways it uses a linear timeline and plot, but in others it does not. I finished it feeling confused, I'm not sure why it stopped when it did and how it did. I'm not 100% sure of anything that happened during the course of the plot, because events change during Ursula's different lives and the ending didn't give me a sense of closure from the fluid nature of time in the book. Perhaps the story doesn't really have an ending, but the book does. Each time Ursula comes back I was interested to see how her life would change this time and which choices lead where. However, Atkinson didn't always pinpoint those exact moments and choices to the reader, or at least I don't feel like she did. In the middle of a new timeline some events seemed like they should be different but somehow they stayed the same and things that seemed like they should have been the same somehow turned out completely different. It was very gripping and I was engaged through the entire work, but I was also confused and left unsatisfied. Since Ursula is born in 1910 her lives all journey through WWI and WWII, which I enjoyed learning about through her different experiences. Ursula takes on many different types of roles through WWII and I liked reading about her varied lives, I felt like I came to understand and appreciate that time period more. Atkinson did an outstanding job at making me feel as though I was in the moment, feeling, hearing, tasting, smelling, and picturing the events as though I was standing behind the characters at the time. The book felt so real, I cried and felt shaken at times because of how Atkinson pulled me into some depressing and difficult circumstances, especially during the war-time violence. The narrator's voice was 3rd person omniscient, sometimes following the thoughts and actions of different characters (mostly while Ursula was a baby and adolescent), but for most of the novel the narrator stuck to Ursula. I sometimes was caught off guard by reading other random people's perspectives, characters outside of Ursula and her family members, which after reading I still don't know for sure why some of those perspectives were added. So, I feel like some events and perspectives were a bit unnecessary and simply made to distract or confuse the reader about what was going on that was really important to the plot. There were some scenes or events that seemed crucial and interesting in one timeline, but were left unaddressed in others and I don't know if they happened again in the other timelines at all. The characters were fascinating and I felt like I really came to know and love a few of them. However, some of the characters remain a complete mystery to me when it comes to their purpose in the story or if they were who I thought they were. The novel addresses many different interesting topics: true love, motherhood, lust, marriage and commitment, women's rights, education, war and oppression, domestic violence, and the strength of the bonds that hold hold friends and siblings together. I am mystified by what Atkinson might be trying to really convey with this piece. Since some events in the book that were changed did not depend upon Ursula, choices made by characters even before she was born, I wonder if all of the characters in the book had the power to live their lives over and over, we just followed Ursula more closely and she was able to sense her past lives somehow while the others couldn't. I'm not sure of anything. Overall I truly enjoyed reading this book and would recommend reading it, but I don't think I'll be reading it again, maybe if I did then it would make more sense the second time through though. I just wanted all of the puzzle pieces to make more sense independently by the end and fit together in a way that made the work feel resolved, but I don't think they did. I recommend drinking a strong cup of loose leaf black tea, steeped for around 5-8 minutes. Using loose leaf tea and steeping it for this long will make it "strong enough for your spoon to stand in," as some of the characters in this book want their tea to be. It will add to the the already detailed atmosphere Atkinson creates, making you feel like you're enjoying English tea time with the characters themselves, brewing it just as they would have. Plus, you'll probably need the extra caffeine to help you focus as you stay up all night reading this book that you just can't put down, not yet.